Two centuries ago, Jacob and Wilhelm Grimm published their first volume of fairy tales. Since then, such stories as “Cinderella,” “Snow White,” “Rapunzel,” and “Hansel and Gretel” have become deeply woven into the Western imagination. 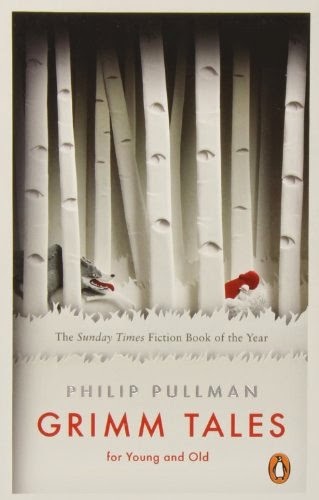 Now Philip Pullman, the New York Times–bestselling author of the His Dark Materials trilogy, makes us fall in love all over again with the immortal tales of the Brothers Grimm. Here are Pullman’s fifty favorites—a wide-ranging selection that includes the most popular stories as well as lesser-known treasures like “The Three Snake Leaves,” “Godfather Death,” and “The Girl with No Hands”—alongside his personal commentaries on each story’s sources, variations, and everlasting appeal. Suffused with romance and villainy, danger and wit, Pullman’s beguiling retellings will cast a spell on readers of all ages. I love fairy tale retellings. I love it when authors take the very thin characters in the traditional fairy tale and give them proper motivations, so that their actions become more understandable. I also love it when an author takes the fundamentals of the story and uses them in original ways. This is not what this book is, however, and Pullman makes it clear in his very interesting introduction. He talks about why fairy tale characters are so lacking in depth and why so are the settings. He doesn't criticise this, and explains it's all about not getting in the way of the pure story. He explains that his renditions of the stories won't aim to add depths or present subversive views, or anything like that. What he'll do is to tell each of the stories in the way he would tell them, editing anything that he feels obstructs the way of the story, adding anything from other retellings that he feels adds to the stories and makes them better. I wasn't sure this was what I wanted, to be honest. The lapses of logic in fairy tales do bother me, so I didn't know if a straight retelling was going to be my thing. I thought I'd give it a try anyway. At worst, I'd get a good idea of the basics of the less well-known tales. I think Pullman completely succeeded in what he set out to do. The stories read really well. They flowed smoothly, lacked the repetitive nature of some of the old versions and I felt the humour was more easily able to shine through. The problem is, even forewarned about what I was getting, I kept wishing I was reading something different. I just couldn't get over the fact that these people too often acted in completely illogical, stupid ways. And this, I'm afraid, really did hamper the stories. Instead of going with the flow and just accepting that I was not going to find people acting like reasonable human beings here, I found myself grinding to a halt and going "why on earth would you....??" For instance, in Faithful Johannes, there's an initial bit where we're told that the king couldn't die in peace until he'd made Johannes promise he'd keep the Crown Prince from a particular room in the castle. This is because if the Prince goes into this room, he'll see the portrait of the Princess of the Golden Roof, immediately fall in love with her, and endanger his own life. Right, so, why on earth would you keep the portrait there? Why not destroy it? It's not a major part of the story (there are endless ways in these stories in which Princes fall instantly in love with women they haven't met), but it's the sort of thing that drives me crazy. And it's the sort of thing Pullman has no interest in fixing. I also had a major issue with the portrayal of women. Mostly, they're either stupid and incredibly passive or they're actively evil. Bah! There were a few good ones here, and several were really funny, but many were just plain annoying. MY GRADE: It's a bit unfair of me to lower my grade because this is not the book I would have wanted it to be, but I grade purely for my enjoyment, and there was way too much eye-rolling here. A C+.